Kay reports that Decorah is still doing a fairly normal molt. His two favorite places to perch are on a stump and the bow perch. 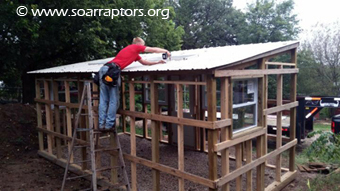 As mentioned in the Spring 2015 newsletter we have plans for renovating one of the 10’x20′ flight pens in the hawk building for Decorah. 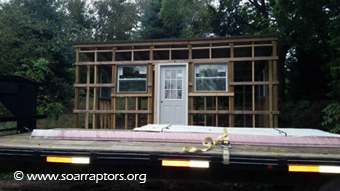 Before those renovations can begin… a new mew needs built to house the usual residents of the 10’x20′. Nolan is working on this new 10’x20′ stand-alone mew. This mew will have two interior rooms and will be insulated just in case we have need to heat for a resident. Just like swapping rooms for your children, move one out, fix up the room for the new occupant, move one child, wash-rinse-repeat… the same will be true here. Once the 10’x20′ mew is complete, new residents will move in and then renovations can begin in the 10’x20′ in the hawk building!